Give your back, legs, and entire body the standing support you need to complete the job with the SmartMat. 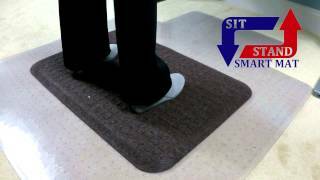 Unlike other mats that require you to bend down and move the mat anytime you want to sit or stand, the SmartMat is foot-activated, allowing to glide smoothly over floors and carpets with just the push of a foot. Slide it under the desk for quick storage without having to bend over and get your hands dirty. This easy-to-use feature has also been proven to increase standing times. The mat's lightly-beveled edges help users when they enter and exit the mat, so tripping isn't an issue. Designed to give you a safer and more comfortable standing experience in a wide range of industries, this slip-resistant mat features a closed-cell backing that's molded to the mat so you don't have to worry about the bottom deteriorating or coming off, even with heavy use. And thanks to the SmartMat's durable Polypropylene construction, it will not fade, rot, or absorb moisture from wet shoes, giving you a mat you can count on for years of work. Available in black, brown, and gray, you'll be in better standing with the SmartMat at your feet. The Premium Carpet SmartMat is available in black, gray, or brown. Each colored carpet cushion is 100% polypropylene to provide a durable surface. The color of this premium standing mat won't fade over time and the plush surface won't absorb moisture and rot. The soft, breathable surface of the Premium Carpet SmartMat sets it apart from its competitors. The polypropylene surface is suitable for shoes and bare feet, alike. What makes the Premium Carpet SmartMat "smart" is its ability to glide across the floor with the casual sweep of your feet. This allows you to easily move the SmartMat underfoot without having to bend over. Nitrile rubber construction makes this gliding motion possible, while also providing a slip-resistant surface when standing on top of the mat. To make full use of the SmartMat, be sure to choose the correct flooring surface where the mat will be used - carpet or hard surfaces. Wood, tile, concrete, and a chair mat placed over a carpet all fall in the category of hard surfaces. $99.00 List Price: $155.00* The list price is the same as the MSRP (Manufacturer's Suggested Retail Price). It may not necessarily be the price at which the product is sold.